Tuesday, January 19, 2010. Photo by Nate Hipple. 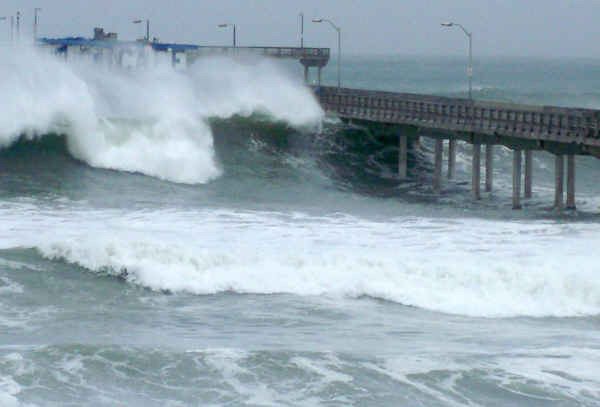 Ocean Beach Pier will be closed due to surf damage. Repairs will be made as soon as possible. Inquiries were directed to the local lifeguards. I called the lifeguards and spoke with Sgt. Travis Gleason, who told me there is some damage to the Pier, but he didn’t have any details. 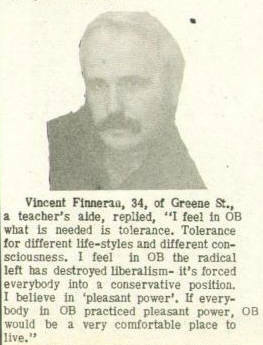 From the People Answer column, Mid-March 1972, OB Rag. When the original OB Rag was publishing back in the early and mid-1970s, it ran a “People Answer” column – sort of a ‘person-on-the-street’ series of interviews on pertinent questions for the community. For the Mid-March 1972 issue (Vol. 2, No. 8 ) it was my responsibility to ask the questions. So, with camera in hand, I went out to Newport Avenue, asking a whole bunch of people what they thought OB needed. I found one gentleman sitting in a local restaurant and asked him the question, wrote down his answer and took his photo. The guy I talked to was Vincent Finneran, a 34 year old teacher-to-be, who had just moved to OB with his spouse, and who lived on Greene Street. Fast forward to today’s OB Rag – a number of new bloggers have joined our online journal – including Shane Finneran – who it turns out is Vincent Finneran’s son! This amazing bit of life’s circle hit me while I was perusing old copies for a series on urban planning in OB. I called Shane, and sure enough, it was his father, who passed away a dozen years or so ago. Shane wasn’t born until 1977 – five years after I interviewed his dad. Shane’s mother still lives in OB, and every now and then contacts us about some video her son has done. Well, now father and son are united, in a sense, in that magical circle of life. Deborah Lee, district manager of the San Diego office of the California Coastal Commission, insists that a public hearing is required before the City can remove its 186 fire pits. Lee said that a hearing will be required because of extensive public interest and the number of pits involved. Lee told SignOnSanDiego that it would take six to eight weeks for a permit application to be docketed for a commission hearing. City officials had argued that removal of the 186 fire enclosures could be approved by commission staff, without the “fuss” of a public proceeding. Go here for the SignOnSanDiego article by Helen Gao. The ninth fire pit that the City claims is in Ocean Beach is still missing. We are sponsoring a contest – whoever finds it receives a free OB Rag T-shirt! Find it, take a photo, and send it to us via our email. 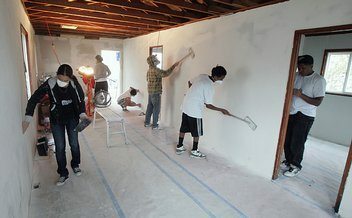 A tiny and gutted Ocean Beach bungalow served as a makeshift classroom for more than a dozen High Tech High students, who got a crash course in home design during their intersession period after winter break. … As part of an intersession project, teacher Josh Saxe offered up his home — or at least, what he hopes will become his home — as the ultimate teaching tool. I was on the pier and started back down the stairs to the parking lot. I noticed the Lifeguard heading my way in the 4 WD SU. He said on his loudspeaker – “Lady on the stairs with the dog on the leash – come down the stairs and over to the lifeguard truck.” She looked around playing dumb. But after 3 times asking for her to come and talk to him, she finally did. She muttered “I did not have a bag but was going to find one and pick it up.” He said “Well, follow me – we will make sure you find a bag and get it picked up.” She looked kind of embarrassed and pissed off to say the least. They got her a bag and TWO lifeguards followed her and her friend to the pile of dog poop and MADE sure she picked it up…then followed her to the trash can where she threw it away….Then He WROTE her a ticket !!!! Gotta love it !!! I am sure she was not from OB….but one many who came to check out the surf !!! Besides the humor and the lesson in OB civility, it is interesting to note that it took 2 lifeguards to ensure the woman got it. Perhaps the high surf meant that not that many were out in the water, so the guards were available. Volunteers are invited to care for this endangered area at Dog Beach on Saturday, Jan. 23 – 9 a.m. Activities include invasive plant removal, native plant rescue, trail maintenance, litter removal. Tools, supplies provided. Dress in clothes that can get dirty, wear closed shoes. 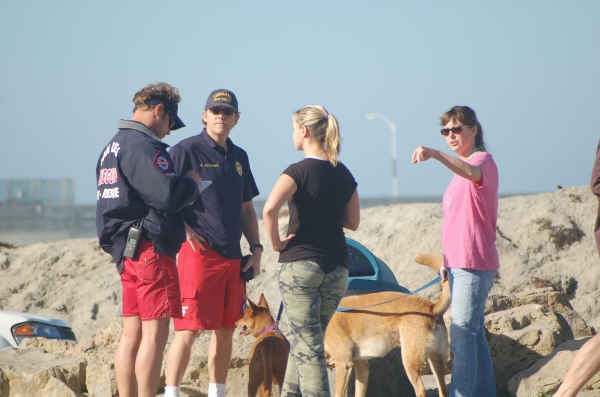 Meet in grassy area near Dog Beach. RSVP: 619-297-7380. Ocean Beach poet Larry Kuechlin hosts a launch of his new book, Along a Ruined Sea, at Jungle Java, 5047 Newport Avenue with “poetry reading, signing, and excellent coffee.” 619-224-0249. This will be on Saturday, Jan. 23 – 4 p.m. to 6 p.m. Awesome story about the Finnerans. Sounds Irish. Irish indeed! My dad was 100% Irish. His parents came over from the Emerald Isle in the late-1920s/early-1930s. They met and married in New York City, where they raised 7 boys and 2 girls. Dickie, thanks for encouraging me to write about the Finnerans. It is an amazing story, Molly. Of course, if I really think about it, it also makes me think I should be older than I am. Thanx for the reminder, Frank, of how OB’s community remains strongly tied to its past. So many dwell here making it home over multiple generations, just like the Finnerans. What an awesome testiment to OB staying power. Frank, I really appreciate your rejuvenation of the piece featuring my dad back in 1972. Seeing the photo and reading the quote is almost like traveling back nearly 40 years and chatting with him on an OB street. I’m going to pass this article on to his surviving brothers and sisters as well as my mom. They’ll all get a kick out of it. Thanks. And cheers to the circle of life! maybe 2 guards wasn’t necessary…but I like to see people being held accountable. Its really easy to walk your dog and let it crap on the ground, and just as easy to pick it up. Not so easy to get it off my shoe. That was classic! Way too many people are just leaving it behind like it’s no big deal. To all who fill sandbags with OB beach sand: do not take sand from the berm! Lifeguard R. Brown wanted me to let everyone know that the berms are there to protect OB – and you should see the big bites in them from sandbaggers. Lifeguards have sandbags and shovels if ya need them. No way! People were actually taking sand from the berms? 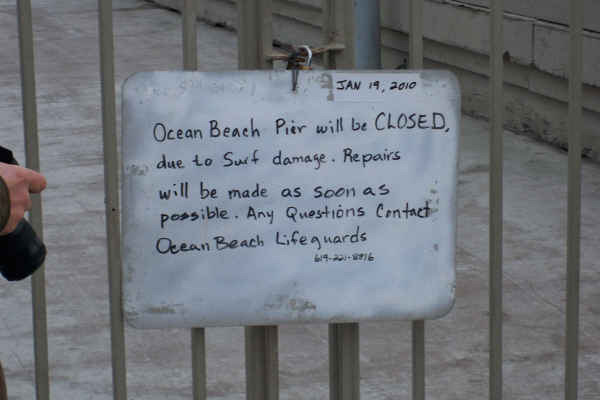 Sounds to me like the lifeguards need to also be handing out a clue to certain folks as well. Not yet. I asked but nothing specific other than some rails were taken out. Just a note, Sand is really cheap at the Home Depo and other hardware stores. A reminder about tonights OB Historical Society meeting at Pt Loma Methodist church. Steve Rowell has some amazing images of local wildlife. Meetings are open to everyone, and there is no charge to attend. Meetings start at 7pm arrive early for a good seat. We just heard that the OB Mainstreet Association offices were flooded, and they won’t be in until Monday. On Thursday January 28th at 7pm at UC San Diego, Amnesty International will be hosting a film screening of “The Response,” a courtroom drama based on the actual transcripts of the Guantanamo Military Tribunals. The film we be followed by a panel discussion that features the Policy Director for Terrorism, Counterterrorism, and Human Rights at Amnesty International, Mr. Tom Parker, Law Professor at Thomas Jefferson Law School, Author of Cowboy Republic, and former President of the National Lawyers Guild, Prof. Marjorie Cohn, and former Marine Corporal, Co-Founder of Veterans for ReThinking Afghanistan, and Larry King Live Guest Debater, Mr. Jake Diliberto. Amnesty International’s Counter-Terror with Justice Campaign works to end violations of international human rights law that have been carried out in the name of fighting the war on terror. Through events such as this panel discussion, we hope to educate the San Diego community on these issues so we can continue to pressure the Obama administration to close Guantanamo and to hold the individuals who violated international human rights law accountable for their actions. I just heard that the top broke off of one of those really tall palm trees on Sunset Cliffs Blvd. It’s the one on the corner of Brighton in front of the church. Apparently the top was laying in the street while crews tried to figure out how to remove it. I’m not surprised because I witnessed the very same tree being struck by lightning some 13 or so years ago. It definitely left it in a weakened state and I was surprised that the giant palm even survived such a jolt. I don’t have a camera but am told it now looks like a giant stick. Hopefully nobody was hurt when the top came crashing down to earth. I know there are small streets that are unpassable or power lines down or street closures all over the area, but they are unlikely to be reported on by the big news outlets unless they are a freeway. I asked Officer Surwilo if there was any kind of real time update for information about that type of thing, and unfortunately there isnt. Stay dry people – and if there is a street closure, power outage, or downed power line in the area, post it up here for others to reference. The San Diego River is expected to reach its highest level in near 12 years Thursday afternoon. The National Weather Service has issued a flood warning for the river. The river is expected to reach its flood stage of 11.3 foot early Thursday afternoon and reach 12.8 feet by late afternoon. The 12.8 crest for the San Diego River will be the highest level since February 8, 1998, according to the NWS. Portions of the Fashion Valley Mall parking facility floods at 11.3 feet, according to the National Weather Service. Avenida Del Rio and Fashion Valley road are also under water at 11.3 feet. The river is not expected to drop below flood stage again until early Saturday morning. 1.] The best way to see the SD River when it’s swollen is to ride the trolley from Old Town to Qualcomm & return. Spectacular. 2.] Monday, the 19th, was an absolutely perfect morning to surf Indicator’s, relatively high tide, easier to paddle out & the huge surf breaks beautifully. But NO ONE was out. In Dec., 1995, I surfed it 3 times in 9 days all by myself, on my little sponge (boogieboard). Where were all you HOT SH*T short boarders or OL’ F*RT longboarders who always gave me so much hassle while I was surfin’ circles around ’em. Can’t now, 2 knee ops & also lower spine, but it was fun to watch & remember. Joe T – I’m in awe. Won’t catch me with my boogieboard unless it’s above 66 degrees. City crews were at the Pier today. KGTV 10 is doing a story on the pier tonight at 6…. about the fire pits – i want everyone to know that they are a symbol, a metaphor – for our way of life that is being threatened. of course, there are more important things to save – like public education, libraries, but we are drawing the line at the fire pits – the schools and libraries are on our side of this line. in order to get to the schools, they have to cross us standing vigil at the fire pits first. They will not be able to come through via the firepits, bodysurferbob, only if they come by sea. if they come for the pits, public ed, & our library by land, they’ll have to get through the portal first and I’m not telling where the entrance to it is. One if by land, two if by sea. And I on the opposite shore shall be, ready to ride and spread the alarm, to every Middlesex village and farm … t’was the midnight ride of Paul Revere. We just discovered that the latest Reader Rant is by Shane’s mom, Nancy. Welcome Nancy!